In response to my invitation to Ask Me Anything, Ann Onymous asked, "If you really had one wish, would you wish to be the woman you have always wanted to be, but that would erase your relationships in the past? Or would you wish you never had the desire to be a crossdressing feminine man? Thats a tough one." Actually, the answer is simple. I have never wished that I was not a crossdressing feminine man. I wish I could do it all over again and if I could, I would not have married (and put my wonderful wife through the ups and downs of being married to a crossdresser). Instead, I would have lived as a woman full-time and definitely gotten electrolysis, maybe HRT and probably not surgery. But since I can't do it over again, I have played with the cards I have dealt to myself. My life has been very interesting. I have achieved some success as a writer (a goal that I had since I was a youngster) and I have also achieved some success as a femulator (another goal that I had since I was a teenager). And I achieved something that I never even considered: success as a femulating writer! 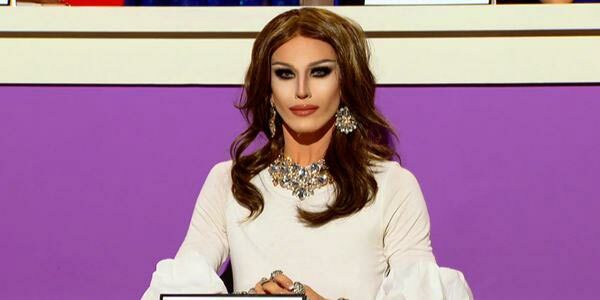 Aquaria femulates Melania Trump on television's RuPaul's Drag Race. It would be interesting to see what my life would have been like if, as a teenager or when I moved out of my parents' house, I decided to Just Be Out and see where it went.... Instead of just being terrified of anyone finding out who I really was. I mean, I wish I was dressing daily when I weighed 118 and had hair past my shoulders! Stana, Your comments mirror my own thoughts in many ways. Had I known what I know now, I may have made different life choices. But I have to be honest, I don't regret the life I've painted for myself, and the wonderful wife, who gave me beautiful children, and has supported me all the way. It's so great you have such a positive attitude! Actually, this article leads me to a bit of a follow up question, which is: What's preventing you now from pursuing electrolysis and HRT?